Great thanks putting it right up. 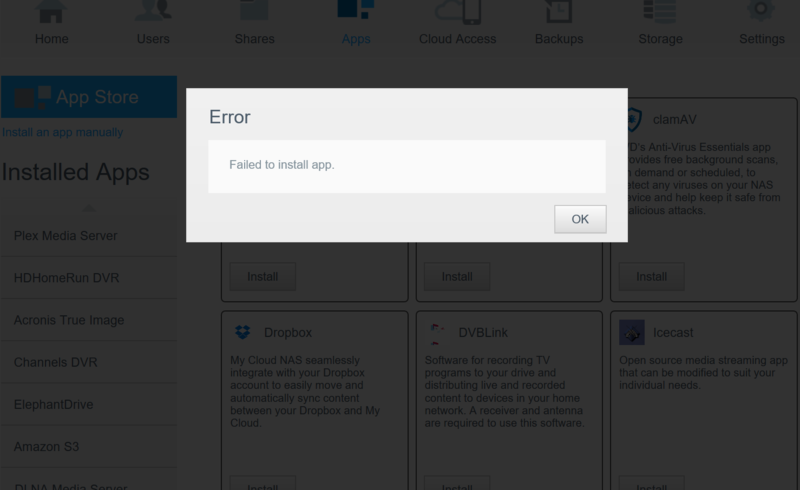 I tried install both the dl2100 and pr4100 and both failed unable to install app. I used manuall install app on both my nases is there something special that needs to be done? Edited by nyplayer, 03 June 2018 - 02:31 PM. What error message did it give? What's your model? There's one package for each specific WD models, they won't install on other models. I have both dl2100 and pr4100 niether worked. Edited by nyplayer, 03 June 2018 - 04:32 PM. Could you ssh into either of them and go to /mnt/HD/HD_a2/Nas_Prog ? Is there an emby-server folder? Or is it still inside the _install directory? I have the 4TB Model: WDBCTL0040HWT. Are any of those files for my model? Edited by nyplayer, 03 June 2018 - 05:32 PM. All code looks good, but I believe the install.sh should copy (cp -r) the data instead of moving. Edited by tafelpoowt, 04 June 2018 - 03:23 AM. Thanks, I'll try that tonight. mv worked fine on my ex2 ultra though. The configure button in the web UI doesn't work... so it doesn't redirect you to the application page, even when it's running though (http://ipaddress/emby-server works). This is caused by the use of CenterType in apkg.rc. So I suggest to leave CenterType and AddonUsedPort empty. Edit: minor suggestion - plex saves the appdata in /mnt/HD/HD_a2/Nas_Prog/plex_config and then symlinks that dir to /mnt/HD/HD_a2/plex_config ... not sure if that really makes sense, but whatever. Edited by tafelpoowt, 04 June 2018 - 04:45 AM. Are we going to get a new package that correctly copies emby-server ? I used the packages in OP, dd to cut off the header (200 bytes) , rename to tar and extract. Made my changes and repackaged. Great job works great using PR4100... transcoding working ... livetv working. Everything appears to be working … one thing I would like to do is change the ports to 8097 and 8921 but it appears I cannot to test outside access they revert back to defaults..... I want to temporarily keep EMBY running on my PC for now. Ignore the part on the ports figured it out. Remote transcoding working QuickSync hardware encoding working on PR4100. Edited by nyplayer, 04 June 2018 - 12:47 PM. @tafelpoowt, thanks for helping us figure this out ! @nyplayer, thanks for the testing feedback. New builds are up in the first post. Thanks everyone. Just a minor thing since I changed the port to 8097 using "configure" in the NAS app it tries to use 8096. Edited by nyplayer, 04 June 2018 - 05:50 PM. What do you mean by this? You have to change it inside of Emby, in order for it to attempt to use a different port. In addition to that, it may require configuration on the NAS side to allow that port.